I love a noodley brothy meal and will often buy one for lunch or make a version at home. I think it’s because the depth of flavour of the broth/soup means it feels satisfying without needing to full up on something fatty or bready. It’s quick to make at home and very forgiving – I can use whatever vegetables I have to hand and adding a bit more or less of something isn’t going to ruin the whole meal (I don’t do well with recipes that need exactness). Maybe eating a home made broth is just psychological – I know all the goodness that’s gone into it and that in itself is satisfying. Whatever the reason – I hope you’ll find the umami/savory flavours in this recipe as tasty and easy to make as I do. Make it for one as I often do or make a bigger batch and freeze or keep some in the fridge for later. Use a deep dish that has a lid ie saucepan or dutch oven. Saute the shallot or onion, ginger and garlic in the ghee or oil until soft – a few minutes. Add the diced kale leaves and saute for another minute. Mix together half a cup of boiling water and the 1TB miso paste and stir until dissolved. Add to onion broth mix. Add another cup of boiling water, soy sauce and mushrooms (not oyster) to the broth mix and simmer for five minutes*. Add the noodles at some point around here and cook as required. Dried noodles will go in with the mushrooms as above but fresh noodles will only need a minute or two. 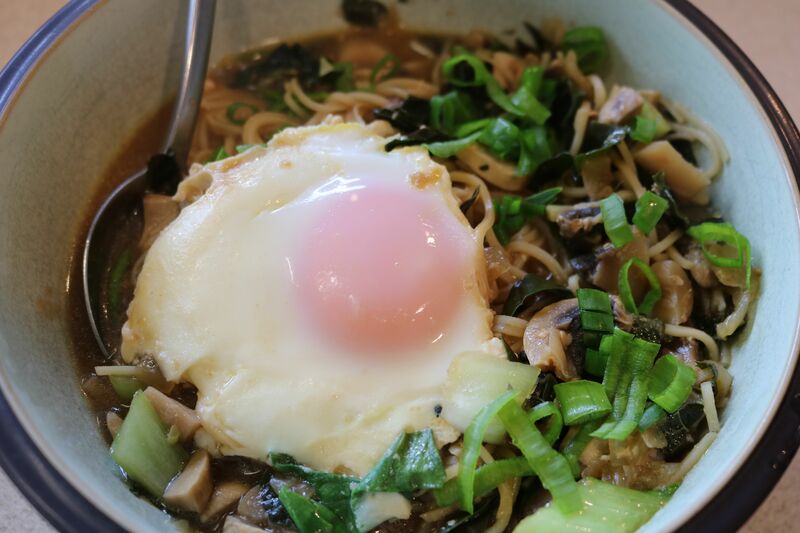 When the noodles are nearly done add the oyster mushrooms (if using) and chard or similar leaves, mix those through the broth and then crack egg(s) carefully into the broth. Keep the lid on until the egg(s) are cooked. It will take one or two minutes depending on the volume in the pan and how cooked you like your eggs. I like mine soft boiled so for one serving it takes under a minute – it’s cooked enough when the whites are just cooked through. The eggs will keep cooking in the broth so take it off to serve when they’re under rather than overdone (unless you like them well done – just cook them for ages). Sprinkle over diced spring onion for serving. *Get prepared by making extra – double the recipe and cook to the broth stage with onion, garlic, ginger, miso, soy sauce and mushrooms and put aside half for a meal in the next few days or freeze it. When using, reheat to boiling then add the noodles, fresh leaves then egg as for the rest of the recipe. Premix the base ingredients (onion, garlic, ginger and miso) and keep a jar in the fridge for this and other soups and stews. 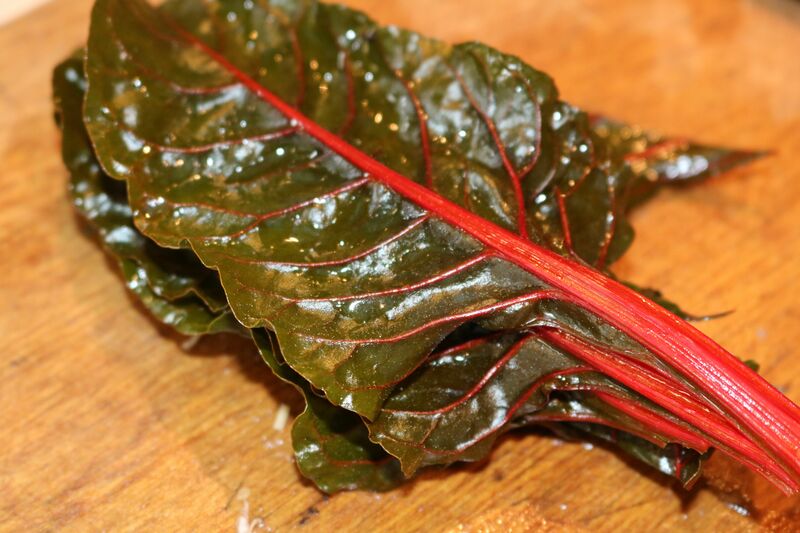 To quickly cut the centre stalk out of the chard leaves (or similar) stack them in a pile and slice it out of the whole pile in two cuts. Add dumplings as well as or instead of noodles. If using both add the dumplings with the boiling water to make sure they cook through. To be really flash make your own dumplings. Add cooked chicken or pork to make a more substantial meal. Add chilli flakes if you like a bit of heat. Simmer a stick of lemongrass with the broth – remove it before serving. Categories: Recipes - mostly featuring homegrown | Tags: quick meals | Permalink.